eliminate dead zones and say goodbye to buffering! Press the WPS button on your main router for 1-2 seconds.Within 50s, press the light button in the middle of the extender for 1-2s. Wait for about 30s and the extender will restart automatically. (3)Enter 192.168.10.1 in a web browser and input"admin".Select the WiFi network you want to extend, type the existing WiFi network's password. (4)Connect your new extender SSID and enjoy the WiFi. 1.Keep your smartphone or laptop being connected to the extender during the installation. Our manufacturer have produced this kind of product more than 10 years, the quality of is very reliable! Seriud provides assistance 24 hours,30 days return, replacement and 12 months warranty. We offer the most thoughtful service and the most satisfactory solution. Any qustions pls feel free to contact with us: seriudstore@gmail.com. We are always here to serve you! So just be assured to purchase!! Excellent Qualcomm Core Chip Scheme-AC1200 WiFi extender adopts Qualcomm QCA9531+QCA9886 chip sullution, which ensures a stable signal expansion and excellent quality. Provide your family with seamless wi-fi coverage, eliminate dead zones and say goodby to buffering. 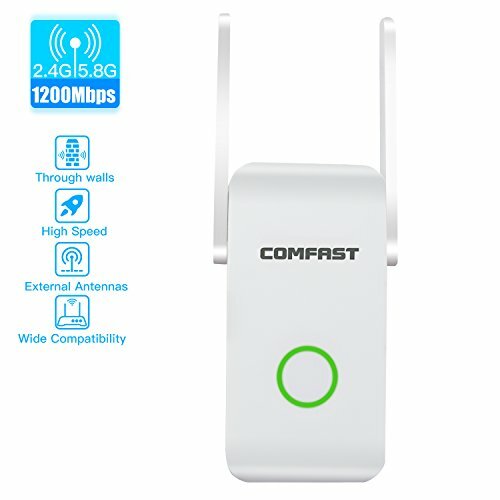 1200Mbps Wireless Transmission Rate-This WiFi range extender uses a new 11AC wireless technology,provides speed of up to N300 + AC867 Mbps. The repeater enables you to achieve faster,more distant and more stable network transmission efficiency and covers up to 1,500 sq. ft.
2.4 GHz & 5.8GHz Dual Frequency Band-The wireless extender supports 2.4 GHz and 5.8ghz dual frequency band work simultaneously,dual channels can be more rapid transmission, intelligent switch, ensure the signal is continuous and stable.It can effectively help signal through one or two walls, including parallel walls and upper and lower layers. Intelligent Tricolor Indicator Light Design-Intuitive understanding the working state of the wireless booster.The light is blue for AP or Router Mode,it's green with good signal and red with weak signal for Repeater Mode. It is blue when first plugged in. When the setup is successful for REPEATER mode, you can unplug and put it between the router and the weak signal area. It's green for strong signal, red for weak signal. You can place it several times to find the best position. Easy to Install and Use-WPS or 3-Step simple settings.99% of customers can get it set up in a few minutes!!! This wireless internet range extender can be simply set up successfully with a smart phone or laptop. Our customer service team provides assistance 24 hours a day,one year warranty. We will put ourselves in the shoes of every customer and feel free to contact with us!!! If you have any questions about this product by Seriud, contact us by completing and submitting the form below. If you are looking for a specif part number, please include it with your message.